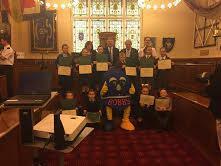 We are very proud to announce that three of our Year 6 pupils, Evelyn T, Brandon-Lee J and Dean B, were among the winners of a recent competition to design a poster for a Police campaign to stamp out the antisocial use of off-road and scrambler bikes. The competition received over 200 entries and the winners were chosen by an independent judging panel. Primary schools in the Bootle, Seaforth and Litherland areas were selected to take part in workshops jointly run by neighbourhood police officers, anti-social behaviour unit staff from Sefton Council and Alder Hey hospital staff. At the completion of the workshops Year 6 pupils were asked to design a poster on the theme of ‘anti scrambler bike use’ in their own time. The lucky winners of the competition attended a presentation at Bootle Town Hall which was attended by the Mayor of Sefton, local councillors, the Deputy Police and Crime Commissioner, former Everton FC players and representatives from Merseyside Police. Evelyn, Brandon-Lee and Dean’s amazing prize is a three day adventure weekend at Winmerleigh Hall in the forest of Bowland. Their artwork will be made into poster size and will be featured in key points around the Bootle area.